By GreenEyedLillies on December 5th, 2008 . Filed under: Pets . So sweet, so delicious! These cupcakes will satisfy your sweet tooth with zero calories! We layered the 7/8″ wide cupcake ribbon on our Soho Bronze grosgrain stripes creating a cake batter with sprinkles look. 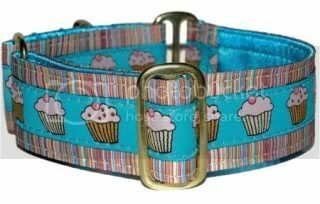 The 1″ version of this collar will NOT have the striped background. Also available in pink at 2 Hounds Design.